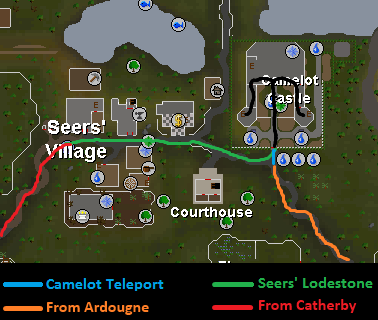 After completing the King's Ransom Quest, you can access the Camelot Training Room (also known as the "Knight Waves Training Ground"). This Miniquest pits you against the Knights of the Round Table to prove your strength. If you're successful in defeating them, you are granted the ability to use four new prayers, and choose an additional respawn point in Camelot to use in the event of your untimely demise afterwards. The Knights' Training Ground is a safe miniquest, as such you will not lose your items if you happen to die during the miniquest. The top floor of Camelot castle. This miniquest is located on the third floor of the Camelot castle, and it is most easily accessible by using the southwest staircase. Inside the training ground, you are unable to use Summoning Familiars, Prayer or Stuns and Bind spells. As the Knights have no weakness it is recommend to use your highest level spell, or Polypore Strike if using a Polypore Staff. 3 Super Sets (Super Attack, Strength and Defence Potions ). If Maging replace Attack and Strength potions with Super Magic (4). Fill rest of inventory with your best food. Note: You can replace 3 pieces of food for an extra super set if you feel like you might run out. (recommended for people below 100 combat) At max, you can take 4 super sets, but do not take more than that. Each knight will drain your combat stats whenever they deal damage (hit above 0). To counter this, drink the appropriate super potion whenever a stat drops at least 10 levels. Keep your defence as high as possible, as this will allow you to get hit less, preventing the draining of your stats. If you die during the miniquest, you will have to start over from the first wave. 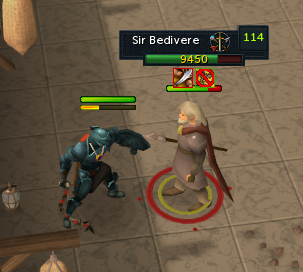 The first knight is Sir Bedivere, who is level 114. He will drain your Strength, Magic and Range. 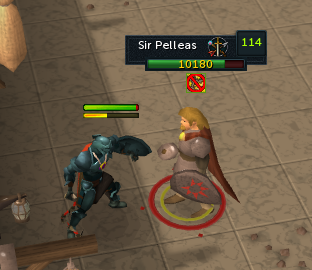 The second knight is Sir Pelleas, who is level 114. He will drain your Defence. 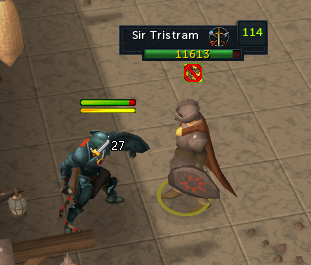 The third knight is Sir Tristram, who is level 114. He will drain your Strength, Magic and Range. 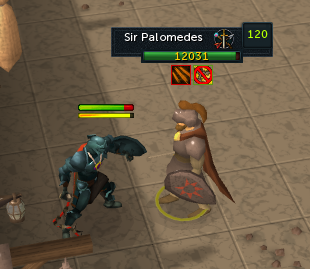 The fourth knight is Sir Palomedes, who is level 120. He will drain your Attack. 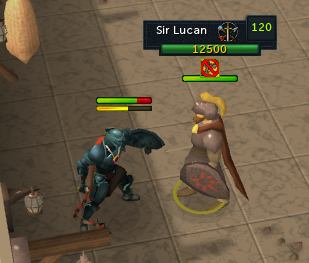 The fifth knight is Sir Lucan, who is level 120. He will drain your Defence. 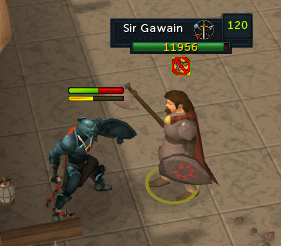 The sixth knight is Sir Gawain, who is level 120. He will drain your Attack, Magic and Range. 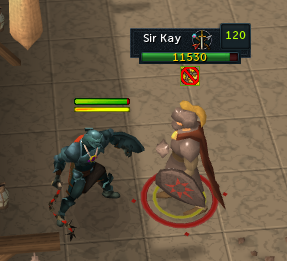 The seventh knight is Sir Kay, who is level 120. He will drain your Defence. 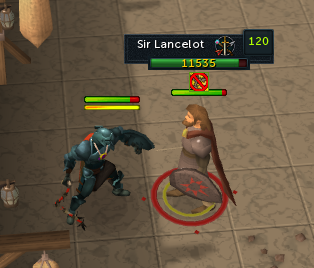 The eighth and final knight is Sir Lancelot, who is level 120. He will drain your Defence, Strength, Magic and Range. Once you have defeated Sir Lancelot, you will be greeted by Merlin who will give you your rewards. Chivalry: Requires 60 Prayer, and increases your Attack, Defence and Strength ratings. Not stackable with other stat-boosting prayers. Piety: Requires 70 Prayer and 70 Defence to use, and increases your Attack, Defence and Strength ratings considerably more than Chivalry. 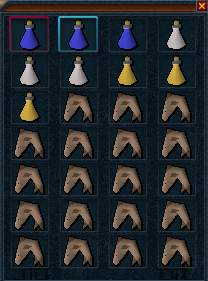 Not stackable with other stat-boosting prayers. 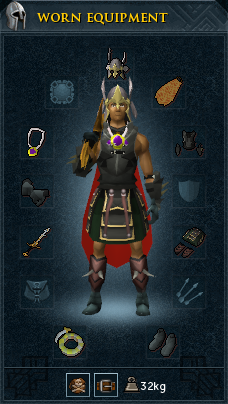 Rigour: Ranged equivalent to Piety, requires 70 Prayer to use. Increases your Defence, Ranged Attack and Strength ratings, and is not stackable with other stat-boosting prayers. Augury: Magic equivalent to Piety, requires 70 Prayer to use. Increases your Defence, Magic Attack and Strength ratings, and is not stackable with other stat-boosting prayers.